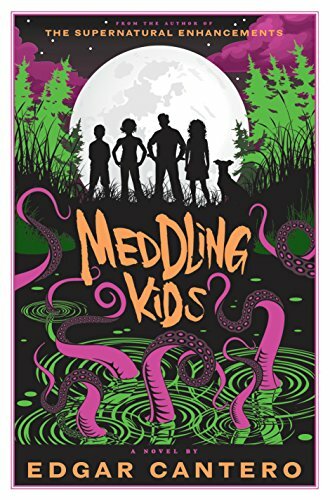 Edgar Cantero's novel Meddling Kids is clever, creative, and funny. It is also profoundly self-indulgent and only occasionally creepy. Individual readers' mileage will vary, based on their tolerance for pointless stylistic quirks and their love for the book's many pop-culture sources. Borrowing from Scooby-Doo, HP Lovecraft, and Enid Blyton's Famous Five series, Meddling Kids opens in rural Oregon, 1977, where a handful of preteens and their faithful dog make up the Blyton Summer Detective Club. The Club has just solved its trickiest case yet, involving a haunted house, a man in a mask, and the local legend of the Sleepy Lake Monster. Thirteen years later, the ex-sleuths have gone their separate ways, still troubled by whatever it was they witnessed during that long-ago summer. Andy is a felon on the run, Kerri is an alcoholic, Nate is living in a mental institution, and Peter, their former leader, has committed suicide. Now led by Andy, the surviving members of the group reluctantly head back to Oregon, determined to lay their demons to rest. I would expect a book with such an aggressively quirky premise to be at least a little annoying, and Meddling Kids more than qualifies. For every element that works (like Tim the dog's entire personality, which is a delight), there's another that feels unnecessary (like the author's habit of periodically dropping into script format). Meddling Kids has many of the same strengths and weaknesses as Ernest Cline's Ready Player One: both stories rely heavily on vintage geekiness, and both left me wondering if a book with girlier pop-culture throwbacks—say, a soapy melodrama featuring Barbie and Ken—would have received anywhere near as much serious critical attention.